One day, Honey Kisaragi's a trendy, class-cutting Catholic schoolgirl. The next, her father's been murdered by demonic divas from a dastardly organization called Panther Claw. When his dying message reveals that she's an android, Honey uses the transformative power of the Atmospheric Element Solidifier - the very thing Panther Claw wanted to steal - to seek revenge against the shadowy clan. Can Honey fight her way up Panther Claw's ranks to defeat its leader, the sinister Sister Jill while managing to escape the watchful eyes of Miss Histler, her school's headmistress? Aided by journalist Hayami Seiji, his ninja father, and his lady-loving grade school brother, Honey sometimes appears as a racecar driver, sometimes as a glamorous model, and sometimes as a beggar, but her true identity is none other than the warrior of love, Cutie Honey! 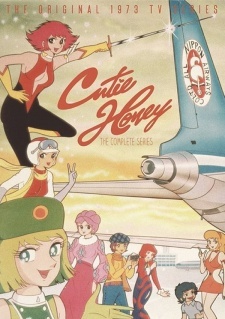 Watch Cutey Honey Episodes Online at Animegg.org. Cutey Honey is available in High Definition only through Animegg.org. Choose an episode below and start watching Cutey Honey in Subbed & Dubbed HD now.